Our parents don’t entirely understand the point of numerous activities you pursue. Mine often wonder why i spend considerable amounts of time and money traveling across the United States to see ‘this mountain’, ‘that lake’, ‘those trees’, and ‘some rock’. 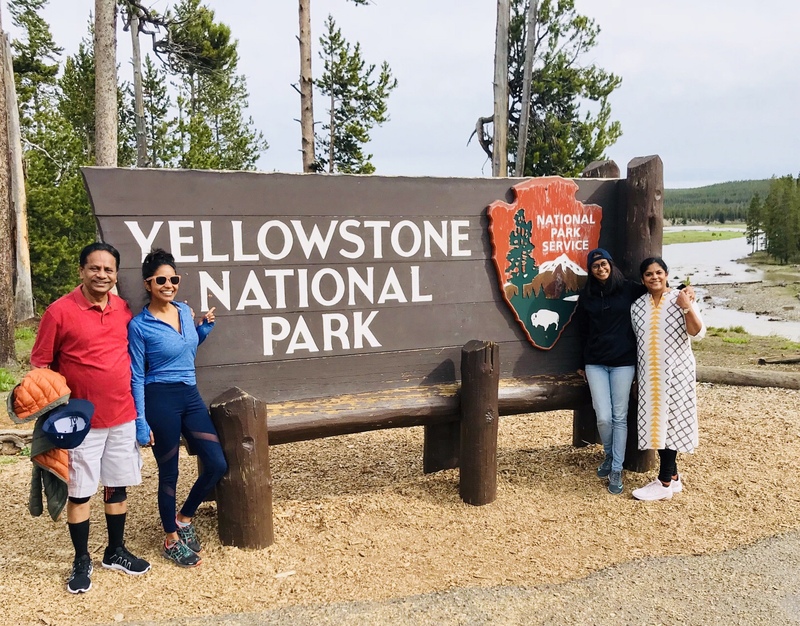 But there is no better joy than to take your slightly amused parents on one such expedition to the Yellow Stone National Park and Grand Teton National Park spanning the states of Wyoming/Idaho, and witness what transpired by the end of it. Wait for it. The trip started off on a low note. The weather forecast for Yellowstone for the 4 days there was slated to be rainy and cold with severe thunderstorms. While reluctantly re-packing last minute weather appropriate clothes, i heard a number of dissuasions ranging from ‘I thought it would be summer’ to ‘Do we really have to spend so much money to travel so far into a thunderstorm?’. I admit, i was disappointed as well. But true to my Army up-bringing, I did what a seasoned General would do. Corralled the troops into battle anyway, knowing very well that our chances of victory were slim at best. Keeping up a confident ‘We will have fun guys!’ attitude was paramount. Looking out of the flight to spot your beach home along the Atlantic definitely helped. And introducing them to the ‘travel jam’ was interesting to say the least! I am an unabashed airbnb-er! My parents, skeptical at first, eventually warmed up to the idea that we are living in a ‘random’ person’s house. Its magical how quickly every airbnb starts feeling like you’ve come home after a long day’s travel. Did the weather gods co-operate you ask? …lush green fields… …drives through and into clouds (quite literally)… …snow capped mountains & more crystal clear lakes. (Yes, this is summer in Wyoming/ Idaho) We entered Yellowstone National Park via the South Entrance, (there are three more depending on which direction you are traveling from). Keep in mind that the park pass is valid for 7 days and covers the Grand Teton National Park as well. Each entrance has a National park Service board. Get a souvenir click! Pro Tip: Shamelessly ask other people there to click your family pic; and return the favor. Sitting atop a volcanic hotspot, Yellowstone National Park is home to the largest concentration of geothermal features such as bubbling hot springs, mud pots, and gushing geysers. (approx. 10,000+) Make sure to walk along the designated trail paths to avoid getting burnt, blistered, worse – completely dissolved! The springs are ~250F (121C)! The sulphuric ‘rotten eggs’ smell we learnt about in chemistry hangs venomously in the air. Take breaks for fresh air and avoid #stupidselfieaccidents. And for the popular pièce de résistance – the Old Faithful geyser! Make sure to note geyser timings (usually erupts every 1.5 hours). Find a place and all you have to do is wait. It is an amazing phenomenon to witness in person and patience pays off. Having seen the Icelandic Geysers in action was slightly underwhelmed, but exciting nevertheless. Unfortunately, i don’t have pictures of the actual eruption because i captured a time-lapse video on Instagram. The park is also home to hundreds of animal species, including bears, wolves, bison, elk and antelope. Again, don’t get too close, and carry bear spray if you are hiking in desolate areas. #the-revenant Now, for my pièce de résistance – the Grand Prismatic Spring! Words cannot describe the reward of hiking up to see this miraculous geothermal feature. The multicolored layers of hues are from different species of thermophile (heat-loving) bacteria (i know!) living in the progressively cooler water around the spring. The Deep blue center is because water scatters the blue wavelengths of light more than others, reflecting blues back to our eyes. Biology & Physics lessons in practice. For me, Yellowstone National park was everything and more. Made sweeter by the fact that we experienced it together as the ‘fabulous four family’ again after 3 long years. Let’s admit it, as you grow older, family trips are less rare. But the sweetest feeling of all was re-introducing my parents to their younger selves; the wanderlust that they instilled in us as children in the first place! Before mainstream air-travel, airbnb, car-rentals, google maps, and credit cards were even a thing. Against all odds they ventured out into the wilderness of the length and breadth of India with two tiny wide-eyed daughters. A love for the outdoors, a sense of adventure, and embracing the uncertainty on any journey is what we learnt from you Mom and Dad! I am only glad you could see it from our eyes this time. This one is dedicated to you both – the original fearless explorers! Check out my previous blog on Zion National Park and the next one coming up on Grand Teton National Park! Next Living on a private Island – What’s it like? Pingback: US National Parks – Why you should visit them! – Life on a post-it! Pingback: Grand Teton National park – 8 of 59 – Life on a post-it!